Planning a vacation or a business trip continues to became much easier as more data about prices, and hotel and flight availability moves online. in the past three years, and 7% more likely to have spent between $2,500 and nearly $5,000 in total online travel during the past six months. Those searching on Bing also are 22% more likely to have a two-week hotel stay for a personal domestic trip and are 5% more likely to have taken between 16 and 20 personal domestic trips in the past year. The Microsoft Bing study also suggests that the period from Memorial Day to September is the best time to ramp up search budgets. July is the highest month for clicks and searches. While searches remain steady, clicks begin to fall in August. Specialty travel searches rose to 31% on mobile, and the remainder to desktop, during this time last year. Transportation and excursions ran up to 28% on mobile, and travel booking services and vacation packages both reached 25%. In 2017 Activities received the highest clicks at 25% on Bing, followed by Cruises at 21%, lodging at 16%, Transportation at 13% and Air Suppliers at 6%. In December, Google added a price tracking feature for flight and hotel searches. The searches come with tips when hotel room rates fall or are higher than usual due to a sporting event like the U.S. Open surf event that takes place in Huntington Beach, California, July 28 through August 5. Google seems to go more for the price-conscious consumer. 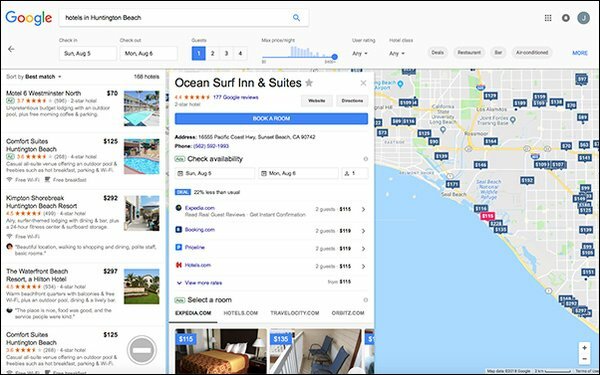 The handy tool tells searchers in query results, but will also send an email when the person signs up for alerts, when hotels in a particular are offering deals such as 10% or 20% off their usual price. Sergey Alakov, an SEO specialist in Toronto, on Friday noticed a test on Google -- Price Insights for hotel listing. Alakov told Search Insider he closely monitors Google's UI changes and often spots tests like this one. For example, last week he spotted a Location Score test for hotel listings. He wrote in an email that Google conducts many tests and rolls out many features for hotel listings that are not available for businesses in other verticals. Price Insights appears to be one of them. The reason, financial gain, is why he thinks many of these features are limited to hotels. Alakov pointed to an interesting post written by Tim Capper, director at Online Ownership, earlier this month about Google's "exploitation" of the hospitality industry for profit, which he thinks gives a good perspective into Google's interest in this vertical. "Other businesses do not seem to be able to benefit from this feature at the moment, or, I would say, Google is not really able to benefit from other businesses a much yet," he wrote. For this test a box appears in hotel’s knowledge panel that informs users how prices at the hotel compare to those of similar hotels in the area followed by “Explore Insights” CTA, Alakov explains in his blog post.